The W Austin Residences lives up to its objective of whatever/whenever, which means whatever and whenever service is needed should be provided, not to mention its famous trademark of lavishing and modernized style of interior design. Upon completion in 2011, the 35-story W Austin Hotel and Residences will be home to the 2,200-seater Austin City Limits Studio Theater, a Spa and a signature dining place that is expected to capture the hearts of music-lovers in Austin. Perfectly situated in the active 2nd Street District, W Austin Residences is surrounded by a variety of restaurants, shopping destinations, music, and entertainment centers. Outdoor enthusiasts will find convenience in the nearby Lady Bird Lake and America’s famous Hike-and Bike Trail which are a few minutes away. The first four floors features lobby areas for both the hotel and residences, several small establishments facing the streets, a spa area, pool terrace and a nice swimming pool while the 200 excellently furnished residential units are found on the upper floors. Choose from one, two, three or four-bedroom units ranging from 641 to more than 3,000 square feet. 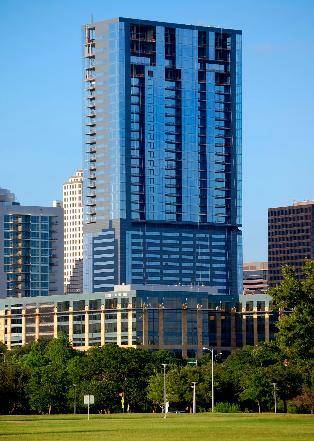 W Austin Condo prices go from $350K to $2.4 million. W Austin Residences have total access to 24-hour concierge, valet parking and room service, daily housekeeping services and in-house spa available to residents. The condominium also offers butler services which include shopping for groceries, taking a dog for a walk, fixing a flat tire and pick up take-out food for you. W Austin Residences stands out among other Downtown Austin Condos as the first LEED certified high rise condo in central Texas and one of the first in the United States. LEED is highest standard for high rise development in the country.